1. In a bowl, combine the sugar, eggs, vegetable oil, milk, and flavoring. Mix together until well combined. In another bowl, sift together the flour, baking powder, baking soda, salt and cinnamon. Add dry ingredients to the wet ingredients until well combined. Fold in the mashed banana and raisins. 2. Pour batter in prepared loaf pan until 3/4 full. 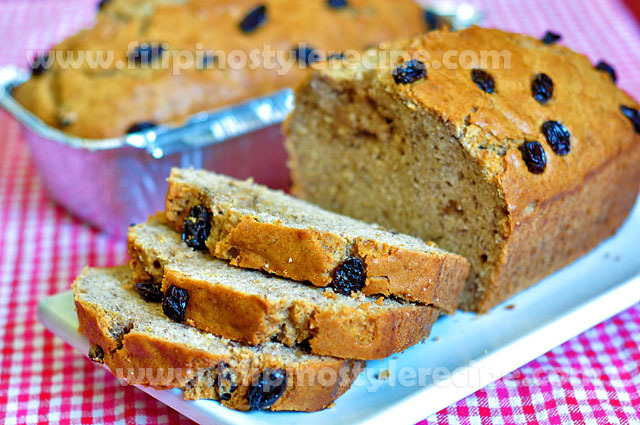 Top with remaining raisins. 3. Bake in preheated oven at 150 degrees F for 40-45 minutes or until toothpick inserted at the middle comes out with few crumbs (not wet batter). Remove from oven and let cool. Run a knife around the pan to remove the bread.